Canon EOS Digital Rebel XTi (name in North America) or Canon EOS 400D (name in Europe and Asia) or Canon EOS Kiss Digital X (name in Japan) is a 10MP digital SLR camera that features 10.08 million image pixel 22.2mm x 14.8mm CMOS sensor, covered with a glass includes a piezoelectric device designed to apply dust-clearing ultrasonic vibration to remove dust particles during camera startup, shutdown or manually at anytime, and ability to create a map of any stubborn dirt not removed by the sensor’s self-cleaning action which embedded that into JPEG or CR2 metadata so that during post processing, imaging software such as Digital Photo Professional v2.2 can use and apply the dust map for one-step removal of unwelcome dust blobs from pictures. Other SLR camera specifications include 2.5-inch LCD, EOS integrated cleaning system, DIGIC II imaging engine, 9-point AF, 3fps continuous shooting with up to 27 shots per burst, Picture Style and PictBridge support. DigitalCameraInfo (dead link) reviews Canon EOS Digital Rebel XTi and concludes that plenty of users will enjoy the Canon EOS Digital Rebel XTi. In automatic modes, it’s easy to use, and snapshooters will be pleased with its quality. If they don’t make enlargements, though, users won’t see a difference between shots from the 10-megapixel XTi and ones from lower-resolution cameras. DSLRs should have complete manual controls, and the Rebel XTi scores well on that account. However, it should have been more convenient to control and the dials and buttons should have been better designed, better finished, and more extensive. Unfortunately, it doesn’t feel as though the XTi is built for the long haul. Its parts should fit together better, and it should be better sealed against dust and dirt. However, the camera’s redeeming attribute is its CMOS sensor, which has historically performed well in low light and surpassed the competition at higher ISO settings. Pocket-lint (dead link) reviews Canon EOS 400D DSLR digital camera and concludes with score of 8 out of 10 that image quality is otherwise great except the kit lens’ performance excellent resolution, low noise, good noise reduction, when needed that does not remove detail, and great color control. Metering is good as is white balance performance in all but the auto setting where it seems to leave well alone! The manual white balance settings works a treat of course if you need to iron out any issues, but is slower to use. However, the range of image setting adjustments you can make is pretty much the best in this class of DSLR and you get an excellent suit of software to help play with the RAW files this camera makes along with the usual array of JPEGs. The EOS 400D has its foibles not least of which is the kit lens. However, it is capable of superb results, is easy to use and it’s a great price given the kit levels and even though Nikon’s D40 has arrived on the scene. More direct competitors, such as Sony’s Alpha 100, Nikon’s D80, and Pentax’s K10D mean the 400D is not the revolution its forbears were within the market. Having said that, it’s still a darn good camera. ePHOTOzine has a hands on review on pre-production model of Canon EOS 400D and concludes that those who already own a Canon EOS 350D will find little difference between this new offering, and their current camera. The control layout is the same and the body is the same size. The camera sports subtle changes such as the improved grip surface, and the 30D-like diamond shaped AF arrangement. Those looking for an entry-level introduction to SLR photography have yet another 10 million pixel model to choose from. ePHOTOzine then does a full review on Canon EOS 400D SLR and concludes that owners of Canon’s EOS 350D camera may well be wondering if the extra pixels, larger screen, improved autofocus and anti-dust measures will make an upgrade worthwhile. The jump from eight to 10 megapixels doesn’t make a great difference to image quality and although the other improvements are welcome, it may not be time to dust off your credit card and start checking how much 350Ds go for on eBay just yet. 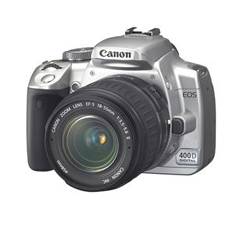 On the other hand if you are looking for your first digital SLR, the Canon EOS 400D represent great value for money. A combination of class-leading low noise levels at high ISO sensitivities, great autofocus performance, good image quality and handling all make the EOS 400D worthy of serious consideration. PC World (dead link) reviews Canon EOS Digital Rebel Xti and very good PCW score of 83 that XTi yields excellent image quality, with practically no noise up through ISO 400, and little noise at ISO 800 through 1600 (the maximum speed available). Priced at $899 (as of November 6, 2006) with an 18mm-to-55mm lens, the XTi is right in line with its chief competitors, the Sony DSLR-Alpha 100K and the Nikon D80. This full-featured SLR delivers excellent image quality at a very reasonable price and is a solid choice for users who like its size and feel. BusinessWeek (dead link) reviews Canon’s Rapid Rebel XTi and concludes with editor’s rating of 4 out of 5 that Canon will face some stiff competition in the digital SLR market this year. In particular, Sony’s A100 has several features that serious consumer photographers may find appealing, in addition to the camera’s price. Perhaps most valuable is the A100’s built-in anti-shake technology, to get clear pictures even if the camera is moving. Canon (as well as Nikon) offers such technology, but it has to be purchased separately. The Canon Rebel XTi is a wonderful camera for capturing those ephemeral moments in your life, from your daughter playing soccer to your son taking his first steps. The good news for consumers is that they will have plenty of other good digital SLRs to choose from as well. PopPhoto (dead link) has hands on review of Canon EOS Digital Rebel XTi and concludes that it’s good for the Rebel breaks into the 10MP club, hardware and software dust reduction, and double the burst capacity of the XT, at a similar 3 fps. Consider this camera if you want 10MP and high-end Canon image controls at an entry-level price. PopPhoto (dead link) tests Canon EOS Digital Rebel XTi and concludes that the SLR is hot for top-flight autofocusing, image quality, control panel can be seen at 10 paces, and sensor dust eradicated two ways. However, it’s bad for needs a second command dial, flash-level setting buried in a menu, and body won’t handle abuse like the EOS 30D. Overall, Canon DSLR fans who want near-EOS 5D performance at a Rebel price and first-time DSLR buyers who want 10 megapixels’ worth of sensor should buy this. T3 (dead link) reviews Canon EOS 400D budget digital SLR and concludes with rating of 4 out of 5 that this is one of the best budget digital SLRs out there, but the anti-dust system isn’t 100% effective, and for the same money you can get the Sony A100, which boasts anti-shake, a longer lens and only slightly inferior picture quality. Nikon’s D80 will be along soon too, making the choice of what to buy even trickier. Still, it’s hard to complain about having too many cracking D-SLRs to pick from! Digital Trends (dead link) concludes with score of 8.5 out of 10 that the Sony has the heft and features including image stabilization for every lens. This makes it easier to shoot in available light with less chance of blur. And the Sony has a more powerful kit lens. Even though the Canon doesn’t have IS, it has better noise handling capability so shots taken at ISO 800 are much more useable. In general, the Canon delivered slightly better images although like wines, you could lean to one over the other simply as a matter of taste. A quick search found the Sony alpha kit going for the same as the Canon–$899. 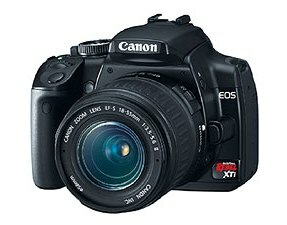 If you have Canon lenses in your closet, there’s no issue, then buy the Digital Rebel XTi. If you own any Konica Minolta lenses, buy the Sony alpha DSLR-A100 since it uses a KM mount. If you don’t have either one, the Canon takes it but just barely. It all came down to the prints, and the Canon won by a Jessica Simpson-sized nose. Digital Photography Review highly recommends the EOS 400D with comment that thanks to its blood line and low price the EOS 400D will no doubt be a huge success for Canon. However unlike the EOS 350D, for me it’s no longer the first or obvious choice, so before jumping on the bandwagon make sure you’ve weighed up the competition. PC Magazine gives editor’s rating of 4.5 out of 5 and concludes that Canon Rebel XTi is an all-around excellent performer and an undeniable Editors’ Choice winner in the D-SLR category. It makes buying a 10MP camera a much easier decision. CNet reviews Canon EOS Rebel XTi (body only, black) and concludes with very good rating of 7.8 out of 10 that the camera is good for compact and lightweight, fast and responsive, intelligently designed with shooting-friendly layout. However, its second status LCD has been eliminated, has slow kit lens, no spot metering, and poor exposure of backlit subjects. Overall, the Canon EOS Rebel XTi remains a very good first dSLR, but ultimately a disappointing followup to the XT, which cedes its lead to the Nikon D80. The Digital Picture suggests EOS 30D owners wait for the next 30D upgrade to be released unless they see a must-have feature in the 400D/XTi, or better yet, go for a Canon EOS 5D. For an entry-level-priced Digital SLR, the Canon EOS 400D Digital Rebel XTi has more features than most entry-level-priced Digital SLR buyers will ever use – and has performance and image quality to satisfy many professional needs. Camera Labs tests Canon EOS 400D / Rebel XTi and concludes that the Canon EOS 400D / Rebel XTi is a great entry-level digital SLR which improves on its predecessor in many respects. The only thing that’s missing is a cheap lens bundle with Image Stabilisation. This will undoubtedly have potential buyers carefully weighing it up against the Sony Alpha A100 which costs much the same, while those with a little more to spend may be tempted by the superior traditional performance of the Nikon D80. However, it may have very tough rivals, but still comes Highly Recommended. Internode Games Network (dead link) concludes with rating of 9 out of 10 that the 400D is a truly great camera. A good price, a good level of features, and the sort of quality that is both expected and demanded from Canon. While it is not a drastic improvement over the 350D, it is not a step down and it does have its own definite appeal. And the price, while high, is comparatively extremely competitive, cheaper than both of its rivals, the Nikon D80 and the Sony A100 even with two lens as opposed to either of the single lens kits of its rivals. For more features, specifications, firmware updates and sample images, visit Canon EOS 400D Digital official homepage (no longer available) or Canon EOS Digital Rebel XTi official homepage or Canon EOS Kill Digital X official homepage (no longer available).